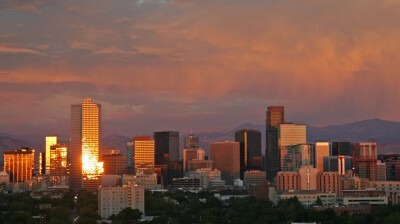 This photo of Denver was taken just after sunrise at the autumnal equinox when the sun rises due east. The view is due west with the brightest reflection from the Wells Fargo building 1.5 miles away. The foothills of the front range begin 15 miles behind downtown. The image was taken with a Canon Digital Rebel using a zoom lens.